Imagine yourself gently swaying on a hammock between two coconut trees as you relax on a tropical island in the South Pacific. We can take you to destinations that have only existed in your most idyllic holiday fantasies. Each of the islands in the South Pacific is unique. The cultures there developed in isolation and the geography of each islands is distinct. Even when the islands aren’t very far away from each other, the landscapes and people can be so incredibly different. An adventure in the South Pacific islands will be an unforgettable getaway filled with sandy beaches, warm sunshine, stunning tropical scenery and exciting activities. To find out more about our tour experiences in the Islands of the South Pacific, please contact us today. There isn’t really a bad time to visit the islands of the South Pacific, as they are beautiful all year round. However, there are two main seasons in this region – the summer (December to March) and the winter (May to November). The winter months are the best time to visit as the weather will be clear, dry and sunny. However, the cost of airfare and other expenses will be higher at this time of year due to the increased demand. If you visit during the summer months you can expect more humidity and the occasional shower, but there will still be plenty of sunshine. Tahiti is known for its top notch surfing and professionals from all over the world come to the small village of Teahupoo to enjoy the massive waves there – which can reach up to 23 feet. Tahiti is also known for the many authors who traveled here and found inspiration, including Robert Louis Stevenson, Pierre Loti, Jack London, W. Somerset Maugham and Herman Melville. Also, the French painter Paul Gauguin famously depicted the tropical beauty of Tahiti in his colourful works. Check out Rarotonga, the youngest of the Cook Islands. This island’s central mountain was once a powerful volcano that has now become overgrown with tropical jungle. In Muri the deep lagoon waters are ideal for snorkeling. The Fiji Islands are a paradise filled with coconut plantations, soft sandy beaches and tropical rainforests. When you see how stunningly beautiful this South Pacific island archipelago is, you will understand why it is such a popular honeymoon destination. Fiji is also a great place for adventure travel, with lots of opportunities for kayaking, skydiving, whitewater rafting and scuba diving. It also boasts luxury spas, superb golf courses and high end beachside resorts. Go whale watching in Tonga and see these amazing creatures breaching in the tropical waters. In Viti Levu, Fiji you can have the rare experience of diving with sharks and seeing bull and tiger sharks up close. It’s a safe experience and you will also be able to see a dazzling array of marine life including black tip, silvertip and white tip sharks as well as moray eels and eagle rays. In Vanuatu you can take a jeep ride to within 150 meters of the crater of a huge volcano. At Mount Yasur you can feel the earth rumbling beneath your feet and hear the bursts of magma from deep within the crater. 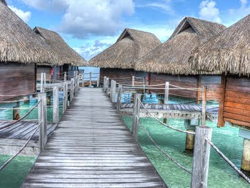 Spoil yourself in one of the incredibly luxurious high class resorts of Bora Bora and visit the famous Matira Beach on the southern tip of the main island where you will be surrounded by a rainbow of fish in the shallow tropical water. There are so many amazing experiences to enjoy in the South Pacific Islands, whether you are into nature adventures or simply relaxing in the sunshine. No matter what you want to do on your adventure in the Islands of the South Pacific, we can arrange the trip of a lifetime for you. Our packages are all inclusive, so every detail is taken care of and any experience you want to have while travelling in the Islands of the South Pacific can be easily arranged – just let us know! The entrance requirements are different for each country, but for many of the countries a visa is not required. For example, all visitors to the Cook Islands can stay for up to 31 days without a visa. In Tahiti anyone from the UE and most countries in North and South America can stay for up to a month without a visa. Check the specific visa requirements for the country you are visiting before you arrive. Be careful when going barefoot on the beaches, as there are sharp coral rocks. The climate is extremely hot and humid, so there is a risk of heat exhaustion. Make sure that you keep yourself well hydrated and avoid strenuous activity in the heat. The smaller and more remote the island, the more limited the medical care will be. Make sure that your travel insurance covers medical evacuation in case you need to be airlifted to a hospital. The CDC recommends that you are vaccinated against Hepatitis A and Typhoid before visiting the islands in the South Pacific. Each country in the South Pacific has its own currency, so make sure that you are aware of the currency of the countries you will be visiting before your trip. For example, in Tahiti the currency is the Polynesian Franc and in Fiji it is the Fijian Dollar. The Cook Islands use New Zealand Dollars and American Samoa uses US Dollars. You will likely find ATMs on the larger islands but don’t expect to find them on the smaller and more remote islands. It is a good idea to take cash with you when you are heading to a very small island. Our Islands in the South Pacific tour experiences will offer you an experience of a lifetime. To learn more about the Islands in the South Pacific and to book one of our fantastic tour experiences, please contact us today.